I was searching for some paper and sketches in my cupboard, and suddenly I found this. 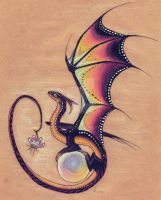 Some of you may rememeber this dragon. I think, that the drawing needs more love and my attention, so I changed some details and added new colors. I like this drawing, so much.. purple..
My scanner likes purple too, it ate all purple colors on the old drawing, so I scanned the new version again. SHUT. UP. 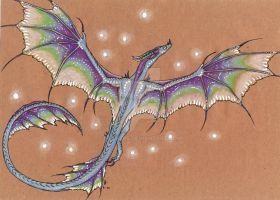 O. M. G.
Most unusual extravagant, elegant dragon, well done! Beautiful! KEEP UP THE AMAZING WORK! I'm curious, what kind of paper do you use? i love how graceful she (?) looks amazing job! Your work is amazing!! Please check my gallery out too!! thats beautiful!!! i love the detail its just amazing!!! I really need a white pen now like you. Amazing. His scales and wings have such beautiful designs on them, it's breathtaking. The dance of magic is such a mesmerizing ritual... 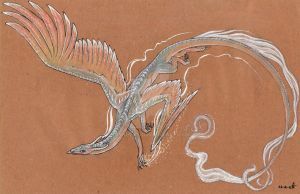 I wonder how such a handsome dragon would fare if he were to dance not for magic, but for the eyes and heart of his mate. That dragon has some amazing balance and finger strength! This is wonderful! I think this is really one of your better works, it's somehow quite different from what you usually make. i love how narrow this dragon is!!! that orb though, great job!